EDINBURG – The Coca-Cola Scholars Foundation recently awarded a student from the Edinburg Consolidated Independent School District a $20,000 college scholarship and made the announcement during a special surprise event at Edinburg High School. Rodriguez plans to receive a bachelor’s degree in biomedical science from Texas A&M University and pursue a career in the field of nursing. She is currently enrolled at South Texas College as part of the district’s dual enrollment program and is also in the Advanced Placement (AP) program. 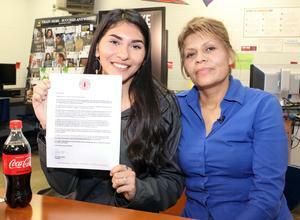 She is a member of several organizations, including the National Honor Society, Key Club, English Honor Society, Avid Club, Science Honor Society and the Wrestling Club.